Oldenburg Vineyards in Stellenbosch, S. Africa, is located in what many consider to the premium wine growing region of the country. The vineyard is in the Banghoek Valley which means “scary corner” due to that fact that it used to the stomping grounds of local leopards. Nowadays they have all but disappeared leaving the valley to the vines. The vineyard was originally a fruit farm founded in the 1950’s which then became a vineyard in the 1960’s. 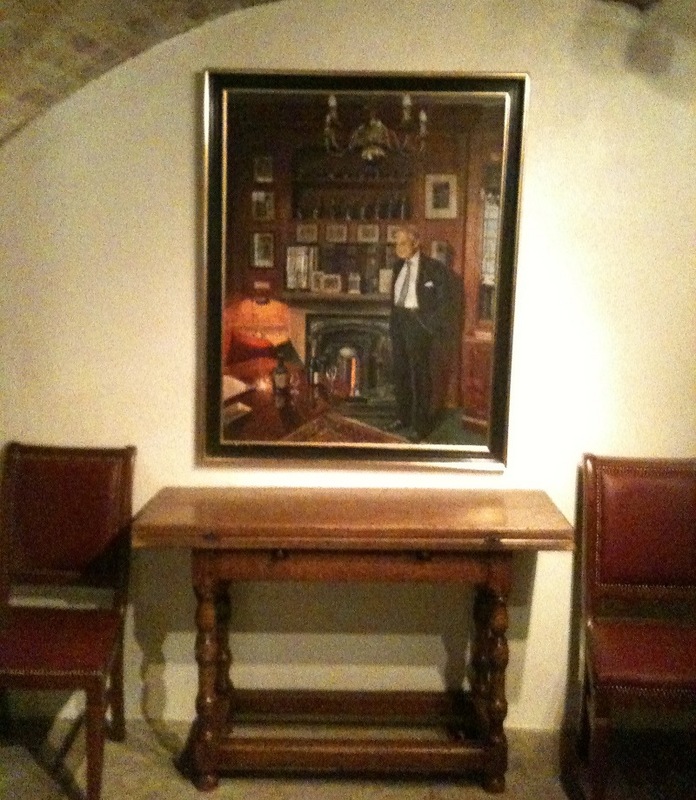 The family sold their grapes to other vineyards until 1993 when Helmut Hohman, the owner died. It wasn’t until 2003 that the vineyard was revitalized by Adrian Vanderspruy, the current proprietor of Oldenburg Vineyards. 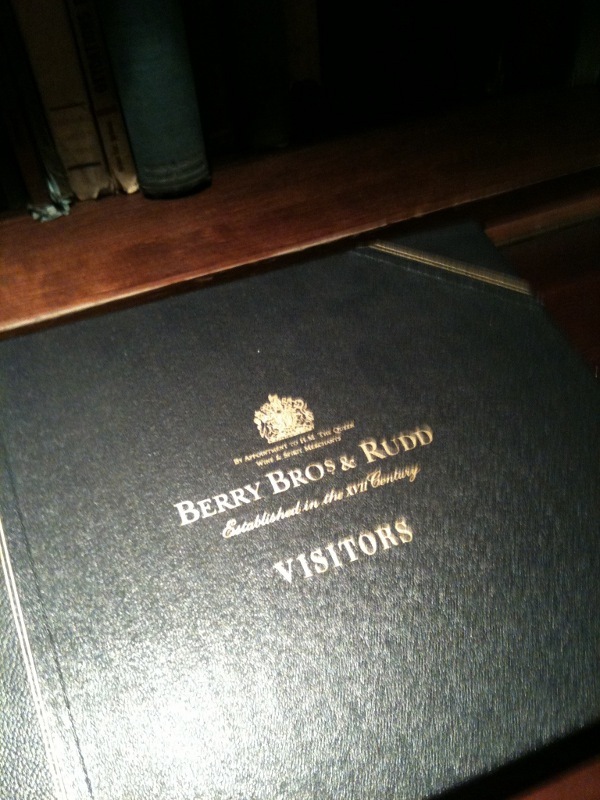 I had dinner with the winemaker, Simon Thompson, in London not long ago at the wine cellars of Berry Bros & Rudd. Over dinner, Simon related how a study had been commissioned of the vineyard site and they had found that it was a very unique site with the best soils placed in the middle of a hanging valley. The location having good sunlight but still being in a protected site. We touched on the fact that they practice “bio-viticulture”, it’s a phrase that was coined by a Stellenbosch professor and the the philosophy encapsulates both the principles of organic and biodynamic winemaking. Oldenburg believe that winemakers should “tread lightly on the environment”. In this case, they use as little copper and sulphur as possible in the winemaking process and the softest approach. They think a healthy microbial soil structure is very important in the grape growing process. They also do quite a bit of green harvesting to ensure that only the best grapes get through. 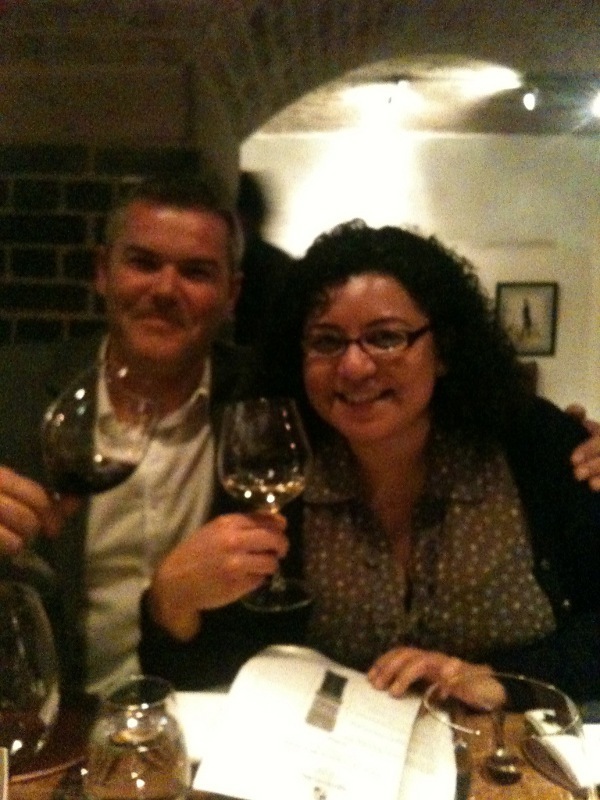 Over dinner we had the first public vertical tasting of their chardonnays. Rather oaky in style, Simon believes that the way forward for South African chardonnay is less oak and I tend to agree with him. He’s a big fan of chenin blanc and thinks it could be the third wine of S. Africa. I tried the 2011 Chenin Blanc, which was delicious – integrated with good acidity, sweet fruit and a long finish, if only all SA chenins were like this. They also make cabernet franc, cabernet sauvignon and syrah. I really liked the reds and thankfully, there was no pinotage. The 2009 Cab Franc was very herbaceous with bell pepper on the nose and quite round tannins. The 2009 Cabernet had a minty character, good acidity and again very well balanced. The star of the evening for me was the 2009 Syrah. Peppery and austere, this wine was beautifully structured and a pleasure to drink. 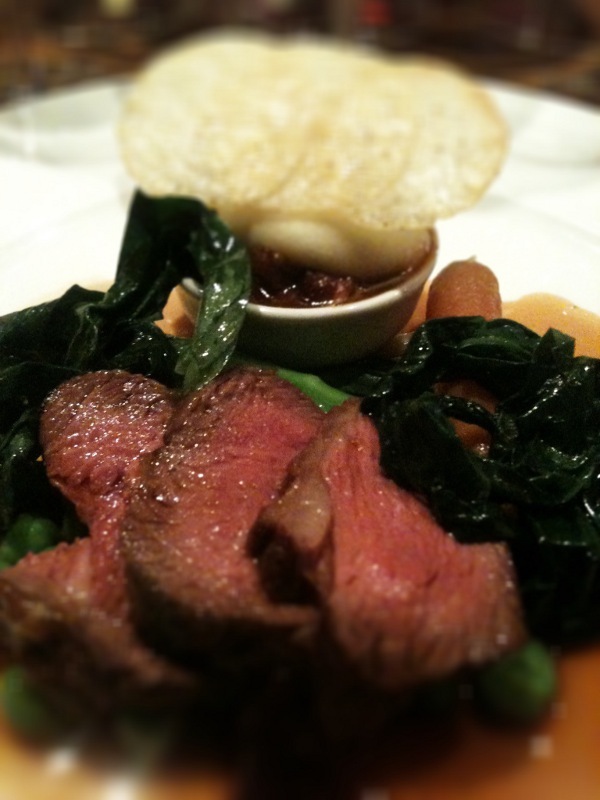 It was an excellent companion to the Roast Rump of Lamp which was the main course. The wines of South Africa are getting better and better. 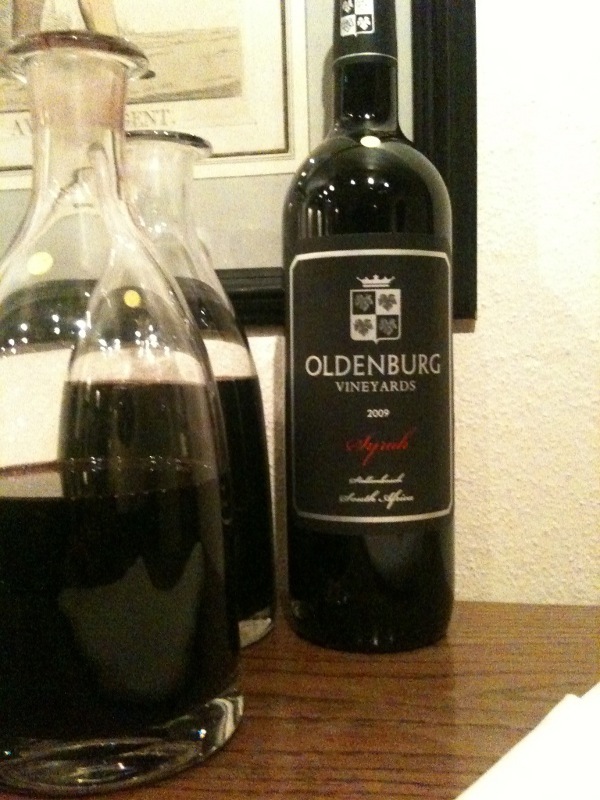 The current incarnation of Olderburg Vineyards is relatively young but they are already producing some great wine. Oldenburg Vineyards wines are available from Berry Bros. & Rudd. They just could’ve have done a better job with the label. I don’t think it reflects the true quality of the wine. maybe they’ll take your advice into consideration!